This fine bird is spread over a very large range of country, and is found in the New World as well as the Old. In consequence of its peculiar habits it is often called the Fishing Eagle. The Osprey is essentially a fish-eater. It seems very strange that a predacious bird allied to the eagles, none of which birds can swim much less dive, should obtain its living from the water. That the cormorant and other diving birds should do so is no matter of surprise, as they are able to pursue the fish in their own element, and catch them by superior speed. But any bird which cannot dive, and which yet lives, on fish, is forced to content itself with those fish that come to the surface of the water, a mode of obtaining a livelihood which does not appear to have much chance of success. Yet the Osprey does on a large scale what the kingfisher does on a small one, and contrives to find abundant food in the water. The Osprey prefers the seashore and the rivers of the coast. Its method of taking prey is almost exactly like that which is employed by the kingfisher. When it goes out in search of food, it soars into the air, and floats in circles over the water, watching every inch of it as narrowly as a kestrel watches a stubble-field. It can see a fish from a height of 30 metres. No sooner does a fish rise toward the surface to take a fly, or to leap into the air for sport, than the Osprey darts downwards, grasps the fish in its talons, drags the struggling prey from the water, and with a scream of joy and triumph bears it away to shore, where it can be devoured at leisure. The bird never dives, neither does it seize the fish with its beak like the kingfisher. It plunges but slightly into the water, as otherwise it would not be able to use its strong wings and carry off its prey. In order to enable the bird to seize the hard and slippery body of the fish, it is furnished with long, very sharp, and boldly-hooked talons, which force themselves into the sides of the fish, and hold it as with grappling irons. Ospreys, particularly young inexperienced birds, can misjudge their catch - if a weak and desparate osprey locks on to a fish that is too heavy for it, the bird could drown. Catching the fish may not be the last of it however. Other birds like Bald Eagles may chase an osprey who is carrying its freshly caught prey, and attack the osprey so that it drops its fish. The attacking thief will then retrieve the dropped fish, leaving the osprey to once more try to catch its own meal. Fishermen in Havanna in Cuba watch ospreys. Where the osprey goes fishing it's a catch for the fishermen for sure. Ospreys are usually migratory and can travel huge distances in their migration. They need wetlands and lakes along their routes. 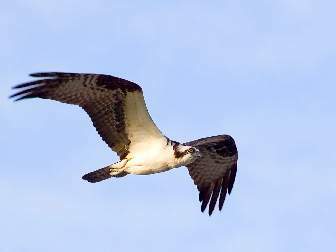 A BBC television program shown in 2006 tracked a young Osprey called Jaws on his first migratory flight. Jaws travelled from Martha's Vineyard off Cape Cod, past New York, down through Cape May and Lake Okeechobee in Florida, past Miami to Cuba and then across the Carribean sea - 350 miles of open water - to Columbia. Altogether from start to finish the journey was a distance of 2886 miles. Another young Osprey on her first migration, and named Tasha, also started in Martha's Vineyard and travelled past New York and on to Cape May in New Jersey, down to Lake Lake Mattamuskeet in North Carolina, and forward on to Miami. She then flew to Havanna and took a similar route to the one taken by Jaws across the 350 miles of the Carribean Sea sea to Columbia but sadly did not make the entire crossing and was lost at sea. For North American Ospreys, the Southern areas are used during the winter for feeding. They then make the return journey North in the Summer to their nesting sites where young birds may then find a mate and breed. Ospreys usually mate for life, and will even return to the same nest each year to breed. The Osprey was undoubtedly one of the birds grouped together under the collective term Asniyeh in the Christian Bible. This word occurs only in the two passages. One of these is Deuteronomy xiv: 'These are they of which ye shall not eat; the eagle, and the ossifrage, and the osprey.' (DEUT. xiv. 12.). The other is Lev. xi.